This one might seem like a bit of a strange choice to replay as it's a pretty basic run and gun arcade shooter, not the kind of thing you need to play much of to get an impression of how it's going to carry on. Plus I got two levels into the Genesis/Mega Drive version the first time around, so it's not like I didn't give it a fair chance. But I'm reasonably sure I promised someone I'd take a look at the arcade version at some point, so here it is. Super Adventures is three years old today! 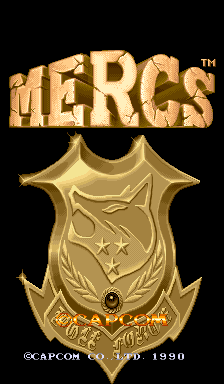 I don't know if that's a cause for celebration, but it's definitely cause for a brand new (hand-pixelled) logo. Though really I should probably pretend those first few months never existed and move the birthday along a little, as the site was pretty terrible when I started off. Games were lucky if they got more than a handful of screenshots and a teaspoon full of commentary back then, as I hadn't yet gotten my head around the concept of taking the time to give them a fair chance. Actually better yet, I could do what I do at this point every year and replay a few of those games and maybe see if they get any better after the first 20 seconds. 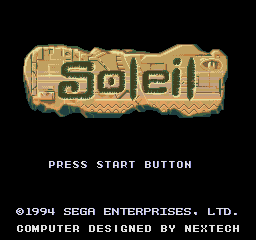 First up is the game known in Europe as Soleil, though back when it first appeared on my site on February 2nd 2011 it was under the US title of Crusader of Centy. New Vegas is the sixth game in the Fallout franchise, released between Fallout 3 and a theoretical Fallout 4 that may or may not definitely be in development right now. Though Bethesda are the current custodians of the series after buying it from Interplay, this game was passed on to Obsidian to make instead... which is a company founded by ex-Interplay employees. Annoyingly they haven't used their years of PC RPG developing experience to fix the issue where I have to disable my Xbox 360 controller to use the mouse in the menu though. This is awesome theme music though, it's like a slightly wild west-tinged version of the Fallout 3 theme (youtube links, don't hate me if there's ads). I know people liked that the first two games began with classic songs by The Ink Spots, but I think its cool that the series has an original theme of its own now. One of their tunes will show up in the intro though, they always do. Today I'm having a quick look at Saturday Morning RPG released on iPhone, Ouya, Linux, Mac and also Windows! 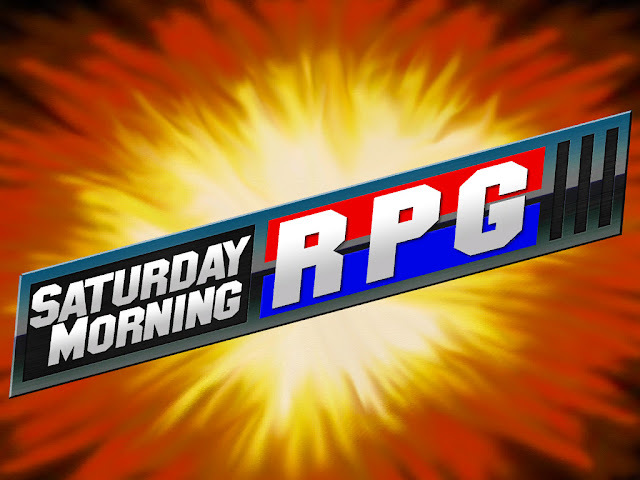 I don't know much about it, but I'm 90% sure from the title that it's likely to be an RPG. I should probably mention upfront that I'm friends with one of the people who worked the game, so my opinion of it is in fact worthless and should be disregarded. 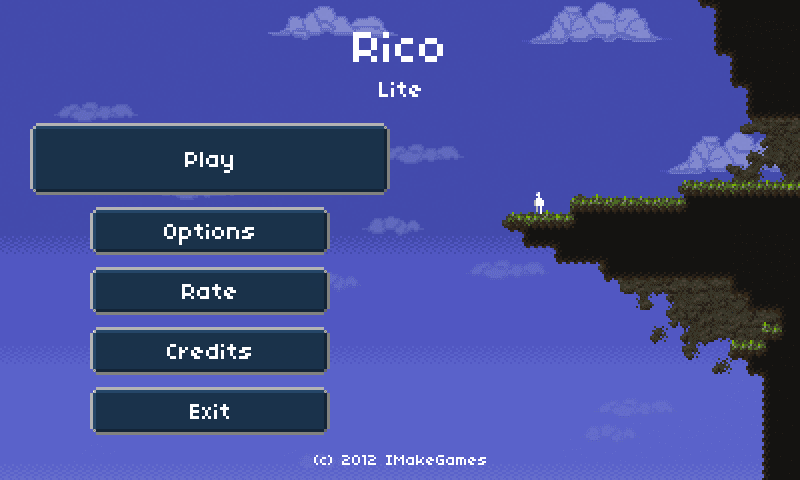 Today I'm taking a look at retro-style indie platformer Rico, because some asked me to and I'm apparently incapable of saying no. My only weakness. Last year seems to have had more than its fair share of games with 'Two' and 'Brothers' in the title, as there was also the monochrome Game Boy inspired action RPG Two Brothers and Starbreeze's single player co-op game Brothers: A Tale of Two Sons. Plus there was also Beyond: Two Souls and Layton Brothers just to make things more confusing. Anyway, this one's the one that's a platformer. This is also out for Windows, Mac, Linux, iPad and iPhone, but I was asked to check out the Android version specifically so that's the one I'll be looking at. It's about bloody time as well, seeing as I've gone a full three years without a single Android game on the site. Sure it looks a bit like a browser game and it probably isn't the best ambassador for the system, but hey it'll be a change. 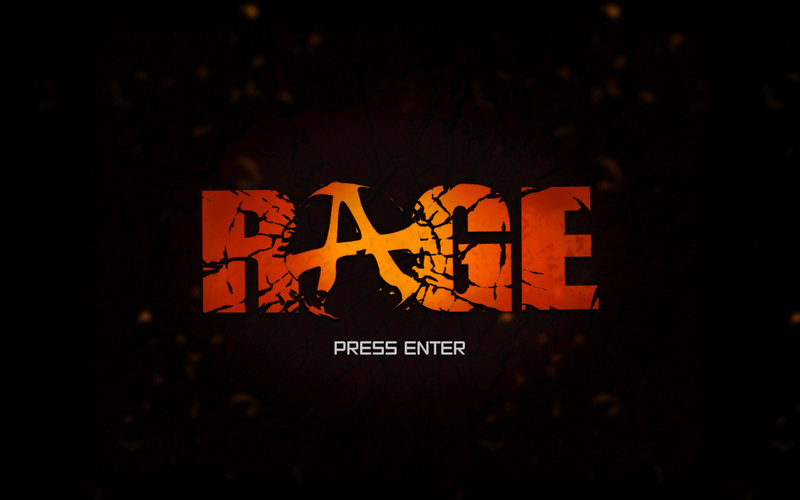 Today I'm having a quick go at 2011 post apocalyptic FPS/racing hybrid Rage, aka. RAGE. I'm not entirely sure why they've used the circle-A anarchy symbol there in their logo, but I imagine it's for much the same reason that Neversoft used it for Apocalypse: because they could. This came out on Xbox 360, PS3, PC and Mac, but I'll be playing the PC version on my beat up old rig. I've actually tried the game on my system once before when it first came out but I was kind of put off by the way it was a sluggish glitchy mess. But it's been a few years now so I'm hoping that all the patches and drivers updates since then have gotten it into shape. Shouldn't take long to find out. For whatever reason and despite my best intentions I didn't play nearly enough TurboGrafx or PC Engine games last year, so I figured that I'd make up for this disheartening insufficiency by playing one this year. 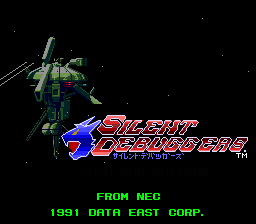 Silent Debuggers is... a game for that console. It was made by Data East, released in 1991, the theme tune could be described as 'funky' and it apparently has something to do with a space station. Other than that I don't know much about it, except that it might be a first person RPG type of thing. 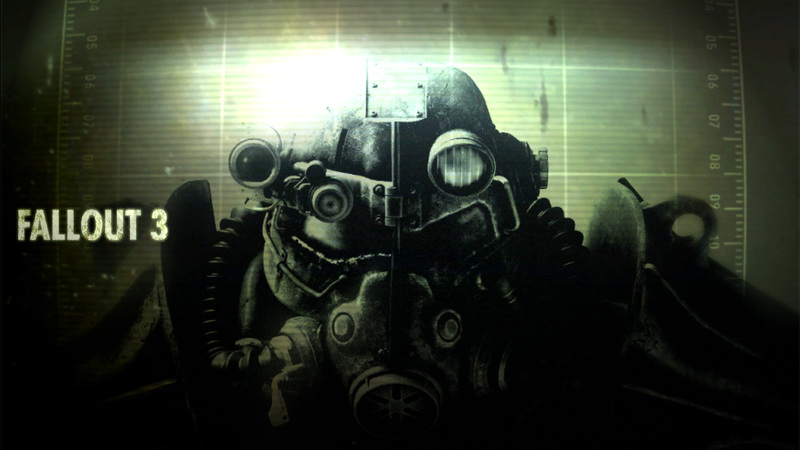 Today on Super Adventures I've decided to have a look at RPG heavyweight Fallout 3, take a few screenshots from it, maybe put a bit of text under them as well. If I can think of anything to say. Interplay had a good run with the Fallout franchise, getting four games out of it in the end, but after a few bad decisions (like making Fallout: Brotherhood of Steel for instance) they found themselves suffering from a wee bit of bankruptcy and in 2007 Elder Scrolls developers Bethesda presented them $5.75 million to take the whole thing off their hands. 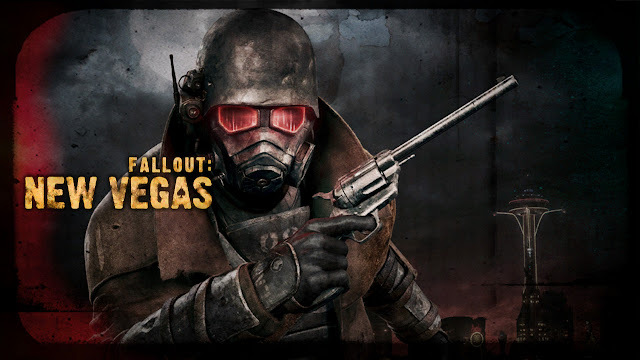 So this is the first Fallout of the Bethesda era, with a new immersive first person real-time approach to gameplay and combat that seems precision engineered to piss off the existing fan base. It was also developed with consoles in mind this time, which was made blatantly obvious to me right away by the fact that I couldn't use my mouse on the menus until I'd disabled my Xbox 360 pad! Oh, like the Elder Scrolls games, this has all kinds of user made mods available for it, which I won't be touching. I've got nothing against mods, much the opposite in fact, I just like to play games vanilla when I'm showing them off on this site. I don't generally play multiplayer games for Super Adventures, as I just don't feel like they're a good fit for the site. But Jihaus here plays what he damn well pleases and today he's taking on the latest MMO to steal a numbered slot in the Final Fantasy line: Final Fantasy 14: Online 2: A Realm Reborn. Ray was hitting a bunch of Final Fantasy games recently and I figured it'd be a good time to jump back into Final Fantasy XIV. I'm relatively familiar with the game from the short time I played the beta earlier this year but this time I have a chance to start over with it and really analyze it. This will be the first MMORPG post of Super Adventures in Gaming so some may be wondering how this is going to work, being that MMORPGs are long, drawn out affairs in which it takes a lot longer to do things compared to offline games. The answer to that is, about the same, I'll just be compressing the timeline a bit here so this will seem a lot faster than the game really is. 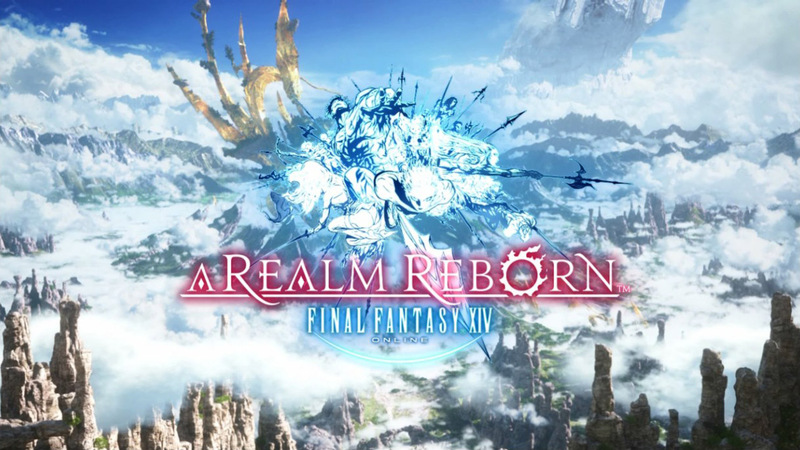 As a bit of backstory, we're actually playing A Realm Reborn, not the original FFXIV Online released in 2010, which was apparently such a critical flop that Square Enix shut down the servers and redid the game, rereleasing it 3 years later in this newer, improved package. I haven't played the original so I can't compare, but I'd say I'm familiar enough with MMORPG mechanics to give this a fair shake. Of course you run into the most horrible of MMO roadblocks before getting here: installing the game, and waiting for it to update EVERYTHING, a process I let run overnight as the ETA was in the thousands of minutes at first. Once that was over, I was able to just use the same account I had and proceed. 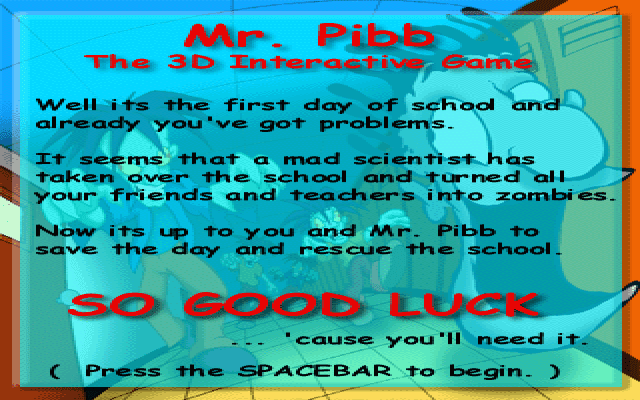 I've never tried Mr. Pibb before, but my extensive research has revealed that it's a type of drink, it has its own 3D Interactive Game, and that I'm playing it right now! I'm cautiously optimistic as interactive games tend to be my favourite type of videogame. According to this screenshot you're looking at right now, a mad scientist has taken over the school and turned all our friends and teachers into zombies! Probably not a coincidence this was made around the same time that Buffy was starting to get popular. Another thing that was popular in '98 was Half-Life, to give this some historical context. But can a cheap fizzy drink tie-in running in DOS compete with Valve's masterpiece? The answer may shock you! Or maybe it won't. I have no idea, I haven't even played it yet. Wish me luck... 'cause I'll need it. 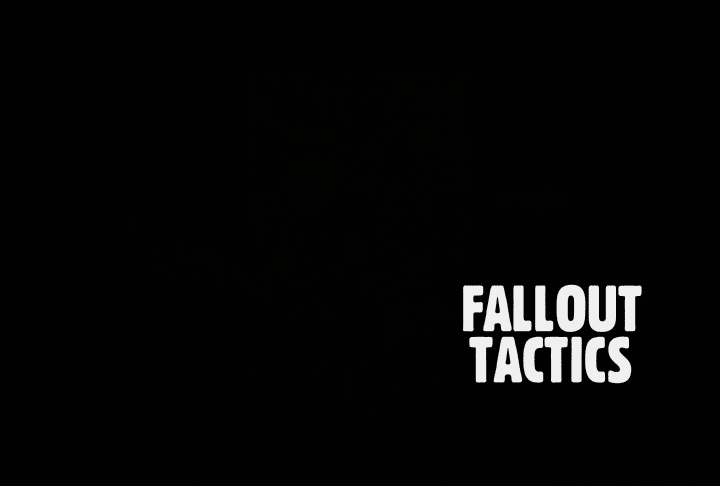 Today I'm looking at 2001 PC strategy game Fallout Tactics: Brotherhood of Steel, not to be confused with 2004 console action RPG Fallout: Brotherhood of Steel. No seriously, you probably don't want to get those two confused. They're both combat driven spin-offs that break with tradition and take the series into a new genre, but one is focused on refining the battle system to be more tactical and involving to the exclusion of everything else, while the other has a Slipknot song on the soundtrack. Uh, this is the tactical one by the way. Happy New Years, welcome to 2014! I'm still Ray Hardgrit, this is still Super Adventures, and I'm still playing games for an hour or so to figure out what they even are and show off some screenshots while I'm at it. 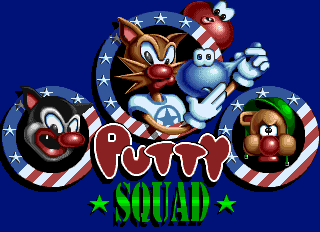 Today I'm taking a look at one of the last games released for the Amiga 1200 computer: Putty Squad, which came out... oh, about a week ago.